I had one of those days. So what did I do? I headed to Crumbs after work. However, I stood in front of the door for about 10 minutes and did not enter... I'm very proud of myself. Is it bad though that I'm tempted to run there now for a treat? The BF bought me this shirt... he has the same one (we're cool like that). 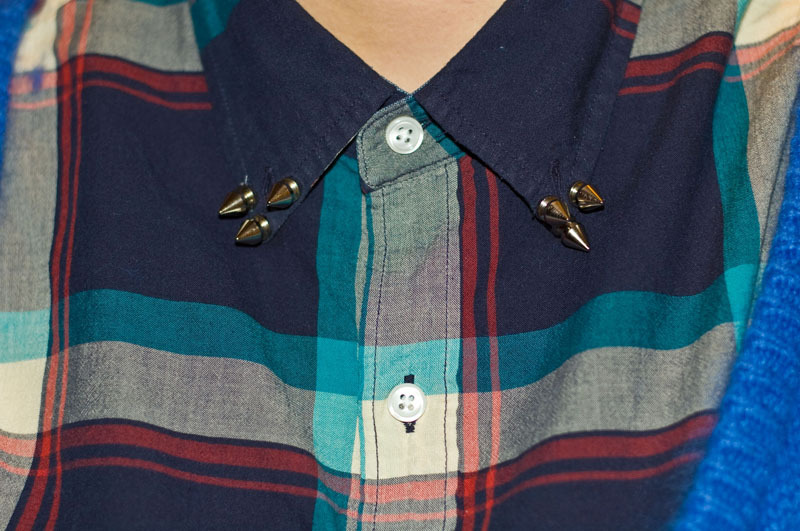 To distinguish mine from his I added some studs to the collar. It adds another dimension to the already awesome plaid print. I'd say that is true love - matching shirts with just a little extra dig to set the girl apart. So cute! great idea with the studs! i used to hit up the candy store after work...or at lunch! like the studs and your bag! i love that blue sweater!